The VariQuest Visual and Kinesthetic Learning Tools Blog contains resources on classroom ideas, lesson plans, industry news, events, and offers throughout education. The National Education Association's Read Across America Day is celebrated in classrooms across the United States each year on Dr. Seuss' birthday, March 2nd. But why stop at one day, when you could make the focus last a whole week with fun activities to instill in your students a love of reading? I've put together some materials for you to use to celebrate reading in your classroom. Download them for free, now! 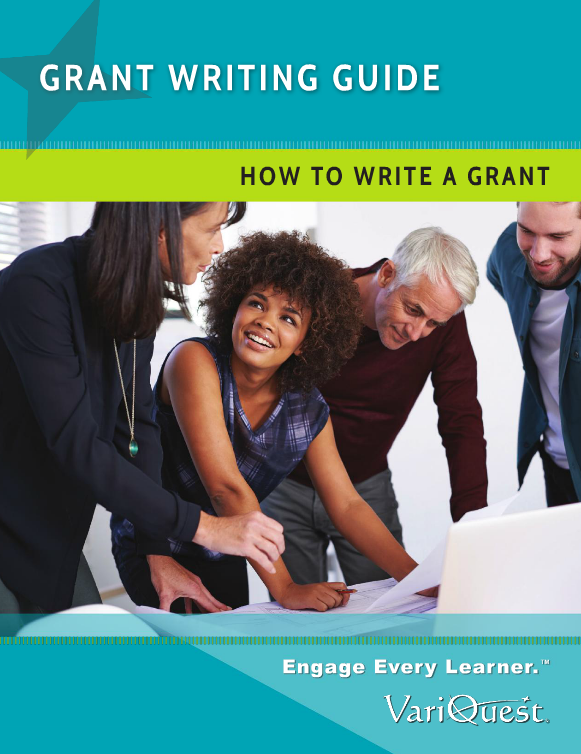 This helpful guide includes an explanation of the grant process, including a checklist (with samples! ), and useful links and resources to find funding! Chinese New Year, also known as the Spring Festival, has been celebrated for thousands of years. It is one of the most important holidays widely celebrated in many Asian countries and territories including Mainland China, Hong Kong, Macau, Taiwan, Vietnam, Malaysia, Singapore, Korea, Thailand. Usually falling between January 21st and February 20th, this year's start of the Chinese New Year will occur on February 5th, and is the Year of the Pig. The celebration lasts for about 15 days. Gung Hay Fat Choy is a common Chinese New Year’s greeting in Chinese Cantonese, which means “wishing you great happiness and prosperity.” On Chinese New Year, the themes of happiness, wealth, longevity, luck and good fortune are celebrated. Some of the traditional celebrations include family gatherings, visiting friends and relatives (baai nin), exchanging “lucky money” contained in red envelopes (lai see), decorating homes with paper decorations and scrolls, lion dances, and fireworks. Chinese New Year is a special holiday to celebrate with your class while teaching them others’ cultures and comparing them to American traditions. I have put together a collection of fun, hands-on and Common Core-aligned lessons and activities, classroom decorations, and craft projects for you to explore and enjoy with your class, and I want to share them with you! It's the end of the calendar year, and most teachers are looking forward to their winter break - that week or two during the holidays where it's time to recharge their batteries and relax, then come back refreshed and ready to charge towards preparing students for the next level. As more and more schools expand their curriculum offerings to include Career and Technical Education (CTE) programs spanning the 16 Career Clusters, the need for resources to help these students has grown along with it. One of these clusters, obviously close to our hearts at VariQuest, is the Education & Training pathway - so along with supporting educators who facilitate this goal with students, we also want to support those students considering a career in the industry! So - do you have an Early Education Program with your secondary students? Or maybe you're a Pre-K or Kindergarten teacher looking for activities to help students learn about numbers and counting? We've got a free lesson plan for you, aligned with Common Core Math Standard K.CC.A.1-5: "Counting Strategies: Build a Fruit Basket!" "Class, what is the Order of Operations?" My energetic class of fifth graders shouted out loud, "Please Excuse My Dear Aunt Sally!" What? Who is Aunt Sally? When students initially learn how to add, subtract, multiply, and divide, they are taught to perform those skills using two numbers and one operation. As they progress to the next levels, they begin to see numerical expressions with more than one operation and word problems that involve multiple steps. Introduce your students to the Order of Operations - and help them memorize the "PEMDAS" or "Please Excuse My Dear Aunt Sally" acronym as early as third grade. Putting this memory into practice can be more of a challenge - so we've come up with some tips and a fun lesson plan activity for your students to drive the concept home! Valentine's Day Classroom Activity - Find who loves what you love! Are you looking for an easy, fun and inclusive Valentine's Day activity for your students this week? Or maybe you're looking for a classroom activity where students can learn about, and relate to one another. Either way, I've got the perfect, easy solution for you - including a free printable! Introducing, "All the Things I Love," A get-to-know each other activity best executed in grades K-5. Finding someone who loves what you love is a fun exercise for the entire class. This activity involves all students by asking them to locate others in the class fitting descriptions showing how similar their likes and interests are. This is a great way for students to learn something personal about their fellow classmates and build community in the classroom. Students will also enjoy the mobility and sociability of the activity! Chinese New Year, also known as the Spring Festival, has been celebrated for thousands of years. It is one of the most important holidays widely celebrated in many Asian countries and territories including Mainland China, Hong Kong, Macau, Taiwan, Vietnam, Malaysia, Singapore, Korea, Thailand. Usually falling between January 21st and February 20th, this year's start of the Chinese New Year will occur on February 16th, and is the Year of the Dog. The celebration lasts for about 15 days. Gung Hay Fat Choy is a common Chinese New Year’s greeting in Chinese Cantonese, which means “wishing you great happiness and prosperity.” On Chinese New Year, the themes of happiness, wealth, longevity, luck and good fortune are celebrated. Some of the traditional celebrations include family gatherings, visiting friends and relatives (baai nin), exchanging “lucky money” contained in red envelopes (lai see), decorating homes with paper decorations and scrolls, lion dances, and fireworks. Chinese New Year is a special holiday to celebrate with your class while teaching them others’ cultures and comparing them to American traditions. I have put together a collection of fun, hands-on and Common Core-aligned lessons and activities, classroom decorations, and craft projects for you to explore and enjoy with your class, and I want to share them with you!